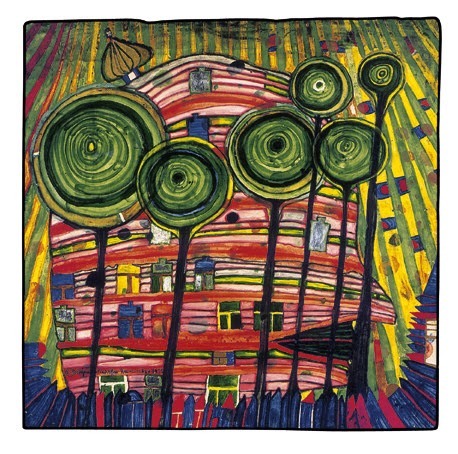 Z has been given the privilege of joining an art class in HeART Studio for a term, and this term they are studying the art of Friedensreich Hundertwasser, whose work I must confess I had never heard about till now. 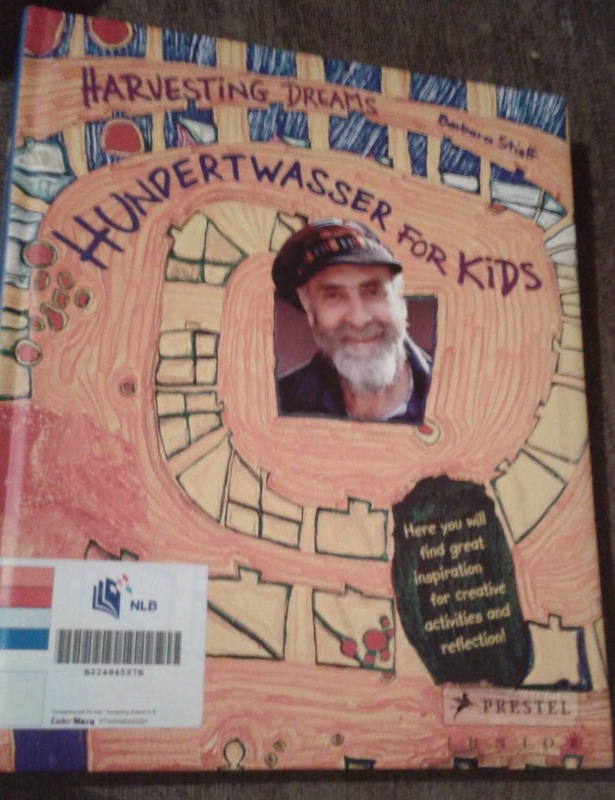 I was pleasantly surprised to find "Harvesting Dreams (Hundertwasser for Kids)" by Barbara Stieff on Amazon, and even more delighted to find that our library carried the title! (Junior Lending English 709.2 STI). You may refer to this link to read our review of Z's first art class. We settled down before bedtime tonight with the book, and had our first impromptu art appreciation lesson. It is a compelling book, with bright colours and interesting photographs of the artist's life and work. Z was immediately interested in it. There is so much to explore, and we will be taking our time with this book - themes of the artist's life and his inspirations, of the beauty he saw in nature and the world of dreams, some theory of colour, art and design, architecture, and a very useful section "Things to Make and Do" behind, where readers can extend their learning by designing their own t-shirts and windows, or finding out about "dark-bright" colours, which were Hundertwasser's favourite. The Austrian artist himself lived a colourful, adventure-filled life, and spent his time sailing around Europe, finally living the last part of his life in a converted pigsty in New Zealand, amidst unspoilt beauty. What a way to live a creative and dream-inspired life! Z was fascinated, to say the least; and so was I, not just with the book, but with his response to the artist and his art. The conversation that ensued surprised me. I asked him which of two paintings he preferred, and why. He said he preferred the one on the left, "433 The I Still Do Not Know" because it had more spirals, and "looks like a palm tree, you know?" 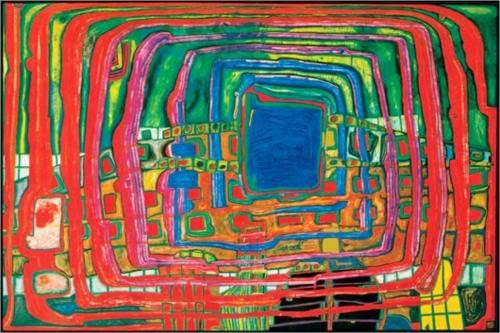 I was intrigued that he was able to draw parallels between Hundertwasser's art and what was familiar to him in nature, which was the very inspiration behind the artist's work - the spirals are a symbol of life and nature. We talked about the colours in the paintings and which colour he liked. He liked the bright red, and I, the brilliant blue. 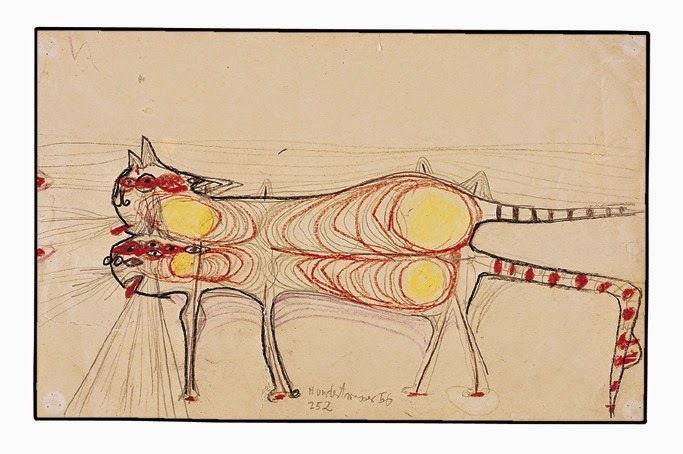 He identified a cat with two heads and two tails in one of the paintings "252 Gatto Doppio (Double Cat)", and said that it had "laser lights" coming from its eyes. He noticed the rainbow colours of the ocean that the boat was sailing on in "831 Tender Dinghi", and said that the lollipop-trees in "745 Blobs Grow in Beloved Gardens" were chocolates, and that the houses were interesting. He said that he wished to design his own "Bouncy Bed", i.e. hotel, just like Mr Hundertwasser designed buildings, and that it would be "dark blue", and also "go round and round like a circle". 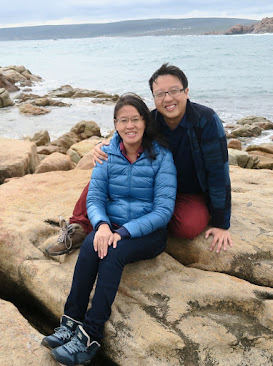 Our older son has always had a penchant for creativity and all things slightly off-tangent, and that is part of what makes being his parents so enjoyable for us. 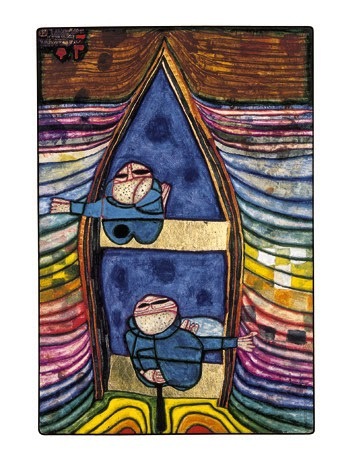 I am looking forward to more delightful conversations which he and I will have with this book and Mr Hundertwasser. As for Z, he can't wait for tomorrow's art class so that he has a chance to draw spirals like palm trees, interesting houses, and cats with laser eyes. I am sure he will. * The pictures of the paintings reproduced here are from the WikiPaintings Visual Art Encyclopedia and the Hundertwasser Non-Profit Foundation.